Metastatic castration-sensitive prostate cancer is an aggressive tumor type that continues to be investigated, experts say. The phase III LATITUDE and STAMPEDE studies both investigated abiraterone acetate (Zytiga), an agent which has advanced the treatment landscape for this patient population. In the LATITUDE trial, 1199 patients were randomized to receive androgen-deprivation therapy (ADT) plus abiraterone/prednisone or placebo. Patients in the abiraterone arm had an improvement in progression-free survival (PFS) from 14.8 months to 33 months (HR, 0.47; P <.001). Median overall survival (OS) was not reached in the abiraterone arm versus 34.7 months in the placebo group (HR, 0.62; P <.001). “Improving both PFS and OS for our patients is exciting and changes what we are able to offer [them] in the first-line setting,” said Tian Zhang, MD. 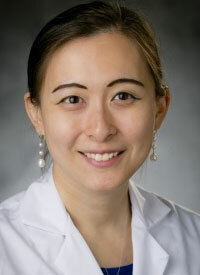 In an interview during the 2017 OncLive® State of the Science SummitTM on Genitourinary Cancers, Zhang, an assistant professor of medicine, Department of Medicine, Duke University School of Medicine, Duke Cancer Institute, discussed emerging results for patients with metastatic castration-sensitive prostate cancer. Zhang: We talked about metastatic castration-sensitive prostate cancer, which is a very aggressive tumor type when it is presented de novo. I also discussed the novel treatments for these patients. We’ve had docetaxel for a good number of years. At the 2017 ASCO Annual Meeting, there were presentations of both the LATITUDE data as well as the STAMPEDE analysis of abiraterone versus ADT. I gave overviews of both LATITUDE and STAMPEDE studies investigating abiraterone acetate. In addition, we talked about metastatic prostate cancer and then wrapped up with some of the trials that are ongoing at Duke Cancer Institute. What impact has the LATITUDE trial had on patients? This is an off-label use of abiraterone acetate. The exciting pieces of data that impact our clinical care for patients in this setting are that it did improve both median PFS by about 18 months and overall survival (OS) compared with ADT alone. The median OS was not reached at the time of analysis for the abiraterone acetate arm compared with 35 months for the patients who are treated with ADT alone. Improving both PFS and OS for our patients is exciting and changes what we can offer these patients in the first-line setting. In general, offering a less toxic treatment also gives our patients more access to care and to these life-prolonging treatments, particularly those who are too frail to undergo chemotherapy. One of the things we touched upon was thinking about who is a candidate for chemotherapy versus oral hormonal agents, such as abiraterone. What are some remaining questions after the STAMPEDE trial? STAMPEDE is an exciting trial that has enrolled both patients with metastatic disease, as well as patients with nonmetastatic disease. We are seeing some early disease-free survival benefits of abiraterone acetate compared with ADT in the nonmetastatic setting. At the 2017 ESMO Congress, we heard some updates from Dr Nicolas James about the patients who had node-positive versus node-negative nonmetastatic disease. These [patients] all had high-risk localized disease. However, [these] are patients who we see every day, such as those with a Gleason score 8 to 10, stage T3 or T4, and a prostate-specific antigen (PSA) of greater than 40, which includes a lot of patients. Half of the patients in the STAMPEDE analysis were nonmetastatic patients. It opens our eyes; this could be an early marker for possible OS benefit over prolonged follow-up period. We are excited to think about the potential activity abiraterone acetate might have in the nonmetastatic setting, as well. What are some other ongoing trials in this space that you are excited about? We have trials at Duke Cancer Institute that are open in the metastatic castration-sensitive setting, as well as trials in the salvage setting for biochemical recurrence. The first one is called ARCHES, and we are thinking about who would benefit from enzalutamide (Xtandi) in the maintenance setting in metastatic castration-sensitive disease. It is enrolling patients with metastatic castration-sensitive prostate cancer and randomizes them to either enzalutamide or placebo. The standard of care for these patients is ADT alone—before we had the LATITUDE or CHAARTED data.